Solar cells made out of a perovskite-structured compound are the fastest-growing solar technology to date. Compared to traditional silicon solar cells, the raw materials used are cheap to produce, simple to manufacture, and their efficiencies are very high making them commercially attractive and a very promising material for high-efficiency optoelectronic applications. However, some of the physical and chemical properties of these materials, which are critical to improving performance, are still not fully understood. Very recently, researchers from the US Department of Energy’s Oak Ridge National Laboratory in Tennessee have employed a unique combination of imaging and characterization tools and atomic-level simulations to solve a longstanding debate about the internal structure of these fascinating materials. 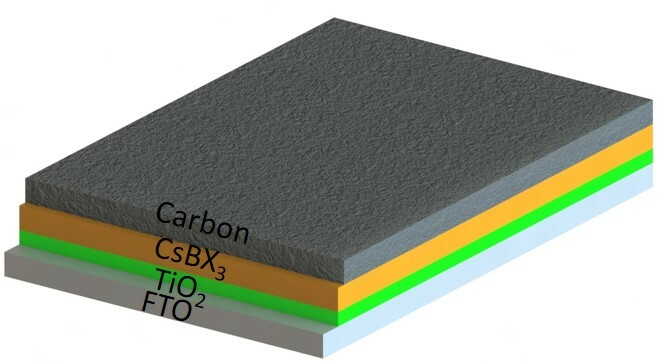 The all-inorganic perovskite solar cells are built in several layers. The bottom layer is glass, which is several millimeters thick. The second layer is a transparent conductive material called FTO. Then comes an electron sensitive layer made from titanium oxide. The fourth layer is the photoactive perovskite. Finally, the top layer is carbon. Among the many techniques used was ZEISS ORION NanoFab SIMS – a unique multiple ion beam microscope capable of generating both helium and neon ion beams to acquire extremely surface sensitive images with very high resolution (<0.5nm). Recently, ZEISS, in collaboration with the Luxembourg Institute of Science and Technology (LIST), has integrated a highly sensitive Secondary Ion Mass Spectrometer (SIMS) into ZEISS ORION NanoFab and made available to Oak Ridge Nationals Labs as a beta tool. SIMS enables researchers to utilize ORION’s extremely fine neon ion beam to very precisely remove material from the sample surface and analyze these molecules based on their weight. The combination of high-resolution imaging and the chemical sensitivity of SIMS allows for detection of the ion distribution with a spatial resolution of less than 20nm. The study revealed that some nanoscale characteristics of these thin films of hybrid organic-inorganic perovskites are different than previously thought. With the help of ZEISS ORION NanoFab SIMS the researchers were able to visualize the distribution of organic molecules within the material, which is an important step towards better understanding the correlation between structure and function and fine-tuning energy-harvesting films for improved performance. The study’s diverse microscopy and spectroscopy measurements provided experimental data to validate atomic-level simulations. The simulations bring predictive insights that could be used to design future materials. Solar cells made out of a perovskite-structured compound are the fastest-growing solar technology to date. Compared to traditional silicon solar cells, the raw materials used are cheap to produce, simple to manufacture, and their efficiencies are very high making them commercially attractive and a very promising material for high-efficiency optoelectronic applications. Very recently, researchers from the US Department of Energy’s Oak Ridge National Laboratory in Tennessee have employed a unique combination of imaging and characterization tools and atomic-level simulations to solve a longstanding debate about the internal structure of these fascinating materials.